Which fusion concept is the most promising for propulsion applications? - which approach offers the highest T/W ratio? - which approach the highest ISP? - which approach is best understood at present? - would it be possible to create a "clean" antimatter-fusion Orion to leave Earth's surface? Could enough antimatter be harvested in space economically? - is fusion propulsion potentially easier to develop than economical fusion electric power generation? Re: Which fusion concept is the most promising for propulsion applications? If you have fusion for propulsion, it is trivial to extract power. So any fusion propulsion scheme will also be able to produce power. Whether it is economical is another question, but given the vast amounts of energy required for propulsion, it would be surprising if it weren't. A concrete example of a fusion confinement scheme that would work better in space is levitated dipole fusion. It has a very simple and stable magnetic field configuration that seems to lead to stable confinement. But a fusion plant on earth would need a way to levitate the dipole, and would also need a fairly large vacuum chamber. In space you don't need any of this. Here is a video of a levitated dipole plasma confinement experiment. Note how long the plasma keeps glowing after heating is shut off. That is evidence of extremely good confinement. The idea of dipole fusion was inspired by the magnetic confinement of ions in jupiter magnetosphere. So if this works it is probably the biggest space science spinoff of all times. A fusion process which releases more energy than its initiation consumes could be usable for propulsion purposes, but not for electric power generation (depending on the conversion efficiency and the types of fusion products). Wouldn't that mean that fusion propulsion (especially in pulsed-form) is technologically less demanding than electric power generation? Say you use a large nuclear reactor not to run an ion drive but to power lasers which zap a fusion target? Orion. Vehicle T/W can be as high as the crew can stand. Orion. We could build one now, with no breakthroughs required. If you have fusion for propulsion, it is trivial to extract power. Because this Orion uses fission, not fusion. It would not be difficult to replace the fission devices with fusion. Read down the page a bit. More seriously, fusion propulsion can be divided into two major categories; Diluted Fusion Product (DFP) drives, which use the reactor plasma directly for propulsion, and fusion-powered electric drives, which don't. Orion is the former. A tandem mirror engine, which leaks plasma out a magnetic nozzle at one end, is the former. VASIMR could be the latter, with an appropriate fusion reactor hooked up to it. Dr. Bussard's Relativistic Electron Beam (REB)-heated drives are the latter. DFP drives have extremely high Isp; generally maxing out in the high six-figure range. Most of them have very low thrust, Orion (and its derivatives, like Medusa) being the obvious exception due to the insanely high power output of the fusion energy source. Daedalus appears to be intermediate. Electric propulsion has lower Isp but higher thrust. For constant jet power, thrust and Isp are inversely proportional, and thus for a fusion reactor of a given size, one can approximate the relationship between Isp and thrust as inverse. Of course, an electric drive requires that the fusion reactor's output be converted to electricity. This will have a finite efficiency, which reduces the power available to the engine unless regenerative cooling is used. Regenerative cooling is only good up to a certain maximum Isp; go higher and some of the waste heat needs to be radiated away, because there isn't enough cooling capacity in the propellant flow rate. Go a lot higher and basically all the waste heat needs to be radiated away, and the reactor conversion inefficiency is a total loss. The above assumes that an electric drive with arbitrary Isp can be devised. Some interesting concepts exist that could go as high as perhaps 70,000 s, but the best we can do right now appears to be VASIMR or MPD at ~30,000 s.
Dr. Bussard had a "family" of engines he called QED, for Quiet Electric Discharge. He wanted to power them with Polywells running the p-¹¹B fuel cycle, allowing direct conversion of alpha particle energy to electricity and resulting in very high efficiency and high power-to-mass ratios (no thermal plant, small/no radiators). With hydrogen, the All-Regeneratively-Cooled (ARC) regime goes up to around 1500 s or so by my calculations, assuming a conversion efficiency of 80%. Final heating of the propellant would be accomplished with a Relativistic Electron Beam (REB). This is the highest-thrust mode that uses only internal propellant, but it is still not suitable for all-rocket vertical launch from Earth. It should be noted that an airbreathing drive using REB heating is also distinctly possible. Even an analogue to the "external burning" scramjet concept is possible, by raster-scanning the REB into the airstream. Above the ARC-QED Isp range is the Controlled Space Radiation (CSR) range. There are two families; one (CSR-A) using REB heating and having Isp values of several thousand seconds, and the other (CSR-B) using exotic methods of propellant acceleration and having a maximum Isp in the vicinity of 70,000 s. CSR-B would be suitable for a fast manned transit to Saturn (Bussard's notional mission was 76 days one-way IIRC, with a continuous-thrust trajectory). At the top was DFP. The alpha streams from the reactor cusps would be mixed with a reasonable amount of extra propellant and sent backwards. Isp could go as high as several hundred thousand seconds. Bussard figured that over a million was unnecessarily high for anything other than a starship. NB: I am not an expert in this field; merely an interested amateur. The above is subject to expansion and even correction by anyone who happens to know better. Technically the use of a thermonuclear weapon for asteroid deflection is a form of fusion propulsion. The explosion has to happen at the optimal deep to maximize the total momentum of the ejecta. The result could be a relatively low isp with an huge amount of reaction mass (ie the ejected fragments of the asteroid), so the total impulse could be very high. I know it's not pratical for a spaceship , but it could be the most feasible form of fusion propulsion in the short term. Non-native English speaker and non-expert, be patient. A propulsion system will be generating it's own G-forces. I'm sure the advanced nuclear physicists are going to rip apart what I'm saying but here goes..
Bussard is right a tocamac won't work, you need a spheromac or some form of electromagnetic confinement device to hold boiling hot gases in a magnetic field. I think you should have graphene (carbon) tubes with Liquid helium cooling the magnets and CO2 as a working gas for the reactor and a layer of aerogel in between the tubes so the liquid helium is contacting the rings and the CO2 is in proximity to the wiffleball. You need some hi-temp photovoltaics to absorb the EM rays and hi temp semiconductors in the corners to take the electron energy. Boron11 Helium 3.... Nitrogen I think will be the waste product. Boron11 will be harder to work with as it isn't a gas at room temperature, you have to turn it into a burning hot gas before you can even slot it into the reactor. 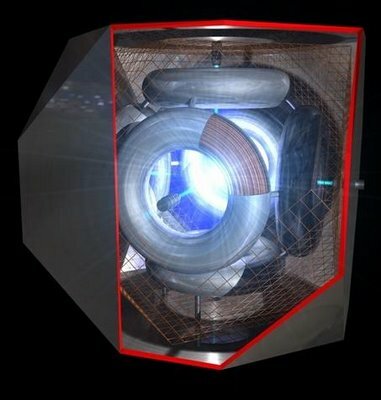 Most of the ship's body would be heatsink just to radiate the heat away as there is no other way of losing heat in space and that fusion reactor is going to create PLENTY of heat. If you could get the reactor working, I propose a form of electromagnetic propulsion suggested by a physicist from Somerset in England whereby a neo-dymium bismuth alloy of tiny pellets are flown around a cyclotron to relatavistic speeds on board the ship and only released in the opposite direction of where you want to go. In an atmosphere the air within the cyclotron will slow down the pellets but in a vacuum you can really go fast. Momentum = Mass x Velocity. Make the mass small (efficient) make the velocity big (efficient). Keep flinging out BiNd pellets thousands of times per second and you can go anywhere you want. How do you do this? Ask the US Navy very nicely to declassify IEC fusion research and make it public. Fund it, Build it, fly it. a) why would you use CO2 as a working gas in a fusion reactor? b) you don't operate a polywell at room temperature or in sea level atmosphere, it operates in a vacuum and you use ion guns to inject boron ions into the magrid. Basically you have rods of boron as electrodes that you charge with very high voltages to cause the boron to ionize. c) Helium3 is not needed. The optimal fuel for fusion is protons and boron 11, the result is alpha particles with direct conversion of fusion energy to electricity. You dont use photovoltaics to convert because they arent photons. d) cycling neodymium in a cyclotron would do nothing useful but generate a lot of gramma rays you would need a lot of mass to shield against. e) polywell research isn't classified, it is proprietary, because the technology belongs to EMC2 Inc. If you want to get the same knowledge, you can either pay them for it, or invest your own money in your own research. The contract EMC2 has with the Navy specifies that EMC2 retains the IP rights to the technology. On the choice of fuel, why p-B11? Isn't it even more difficult to ignite than D-He3 and delivers a smaller specific impulse? I know D-He3 isn't completely aneutronic but mostly so. So shouldn't D-He3 be the fuel of choice for spacecraft? And on Orion, since Orion is basically the only conceivable high thrust fusion propulsion concept (delivering true "torch-ship" performance with possible multi-gee accelerations and a very high specific impulse), how can pure fusion pulse units be designed? There is ICF, where you blast fusion targets with electron beams or lasers to fuse them, but so far this has only worked using D-T or D-D fuel and the laser assembly is huge ... not a good candidate for a high thrust propulsion system. What about antimatter ignited fusion? Could pulse units be designed with an antimatter "sparkplug", or could pulse units be ignited by antiproton beams? How do you produce clean Orion pulse units (no fission?)? p-B11 is preferred because it's fusion products are alphas that allow direct conversion to electricity, no need for any significant cooling, with turbines, or brayton cycle power conversion systems. You need a small cooling system to keep your superconducting coils in the polywell cool, and thats it, no need for huge radiators, and the radiation emissions are FAR lower than any other fuel combination. D-He3 is not aneutronic fusion, it is only considered "clean" when in comparison to fission, but in comparison to p-B11 there is a larger difference in neutron production between p-B11 and D-He3 than between fission and D-He3. This means p-B11 shielding requirements (and shielding mass) are much lower, so this is much better for spacecraft performance and for passengers. Polywell scales in power output rather quickly, so that a polywell with four meter diameter magrid coils produces about the same power output as a shuttle main engine, and because it does direct conversion to electricity, it can power the rest of the ship in addition to propulsion requirements. Orion can't do that. Thrust amount doesnt really matter vs ability to thrust constantly. Orion can't thrust constantly. You have a bussard ramjet that uses polywell fusion as its fusion reactor. In order to reach a velocity high enough to achieve H-H fusion, you start off with the polywell operating on internal fuel, generating a magnetic field for the ram scoop, but you use this magnetic field as a pusher plate for your initial boost out of GEO or L1 into interplanetary space. The polywell is operating on p-B11 fusion at this point, but operating in a hydrogen rich mode to eliminate brehmstralung thermal issues but also to boost thrust. As it reaches a sufficient speed to operate on the incoming rammed hydrogen, it stops using internal hydrogen stores but continues on p-B11 fusion, and with electron guns to feed most of the generated power back into the hydrogen stream after it exits the polywell, which accelerates the hydrogen against the charge of the ship magnetic field (the field both rams the incoming hydrogen and acts as a magnetic de laval nozzle for the exhaust). I am not sure what the minimum speed is needed to stop consuming B11 and change to normal H-H fusion, it tends to be different depending on who you talk to. While cruising at this speed, you can refill your internal tanks with hydrogen to resume p-B11 fusion when you need to decelerate. I think Friedwardt Winterberg's proposal to use the entire spacecraft as a capacitor that is discharged in the form of a hugely intense ion beam to ignite a deuterium target is very exciting, being relatively small, with little precision hardware, no tritium or helium 3 required and Isp ~0.05C. Basic premise is that the fundamental problem with inertial confinement fusion has always been insufficiently powerful drivers - and using his relatively simple approach can create the 1GJ, 30PW driver required to ignite a Deuterium target. He calculates that a 30m long cylindrical spacecraft with a 1T magnetic field ought to be sufficient to achieve ignition. He also finds that using a boron tamper in his linear arrangement he can actually direct the neutrons into the exhaust, substantially reducing the neutron loading on the ship and increasing Isp, both of which allow for greater acceleration. I'd love to see a competent critique of it. The glass is neither half full nor half empty, it's just twice as big as it needs to be. There seems to be a lot of talk about Polywells here ... but as far as I understand it is far from sure whether these things would work ... it's not really a mainstream concept. If would be awesome if they would work, however. On this Winterberg design, how is the capacitor charged? What is the main power source? What would the T/W of such a craft be? I read elsewhere that he suggested to use D-T D-D combined pellets and large lasers to boost huge payloads into orbit. Could his method of D-D fusion be somehow converted into a terrestrial power plant? I believe initial charging is by firing off negatively charged ions into space - I am not sure if it might also be possible to use an electron gun. T/W is not specified, but he talks about the possibility of launching from earth using fusion power - so there is the possiblity of up to 1g accelerations once developed - similar to orion and mag orion. Actually, polywell research is going on at a couple universities now, as well as at EMC2, as well as an open source project I've been hearing about. EMC2 should be issuing their report on the work done with WB-8.1 in the next month or two to the Navy. There are no null results reported by any polywell researchers to date, the technology seems to work. What remains to be seen, really, is whether sustained fusion can be done at a level that allows commercial energy production (or otherwise feasible for other applications like submarine propulsion). Dr. Bussard is about as "mainstream" as you can get with nuclear fusion. All the jokers wasting billions of tax dollars on tokamaks and such without any results to show for it are the real mad scientists. Z pinch could be promising. Maybe a fusion boosted min mag Orion could be practical. It should be noted a fusion rocket need not have sustained fusion. EMC2 should be issuing their report on the work done with WB-8.1 in the next month or two to the Navy.